New Fishing Server is online! If you experience any fishing problems, please contact Sweegy Manilow. Thanks for your patience! Fishing will be going down for maintenance at 12:30AM for a few minutes while we transition to a new server. Please avoid any selftourneys or TFL matches at this time. Thanks! Week 3 is in the books with only 2 undefeated teams left! 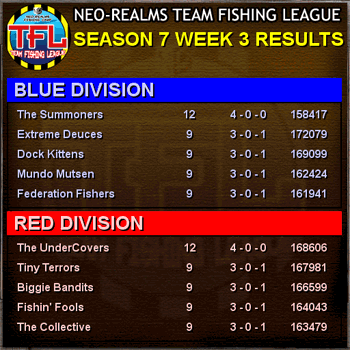 The Summoners remaining undefeated in Blue Division, and The UnderCovers undefeated in Red Division. 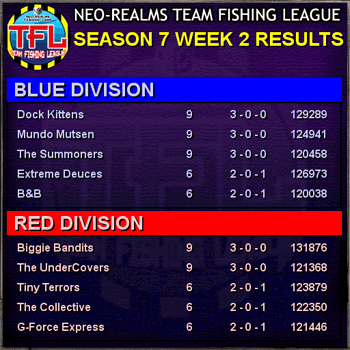 Week 2 is over and The Dock Kittens, Mundo Mutsen, The Summoners, Biggie Bandits, and The UnderCovers keep their undefeated streaks alive! Good luck to all teams for week 3! Season 7 Week 1 Results! 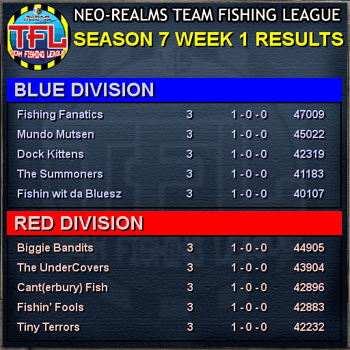 We're off and running with the first week's results in, with Fishing Fanatics pulling in the biggest scores this round! Good luck to all teams next week!